Customized solutions for a quick and trouble-free transfer of empty PET containers of any shape and size from the blow molder to the filler. SMI air conveyors feature a modular design and a great operational flexibility, also thanks to the use of frequency converters (inverters) which optimize the conveyors speed. Furthermore, the stainless steel AISI 304 frame (1) makes the maintenance and cleaning operations easier. It is also possible to adjust the air distribution system according to the type of bottle, by means of manual valves or through the electronic control of the motors speed. In order to ensure a high-quality air filtration, SMI offers a wide range of philtres (G4, G3, F9, H13, etc.) UNI-EN779. Furthermore, thanks to a user-friendly control panel, the operator can easily select the tracks position, according to the product format. 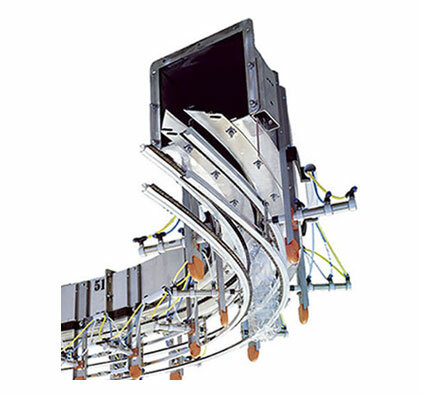 SMI air conveyors can be wall-mounted or hung to the ceiling, with great advantages from a logistic point of view.